that shows an HCCH-TOCSY magnetisation transfer I do not see any transfer from HD to HB, but in my peaks I see a peak that seems it can be connected az Leu CB-HB2-HD22 Can I have these peaks in HCCH-TOCSY? 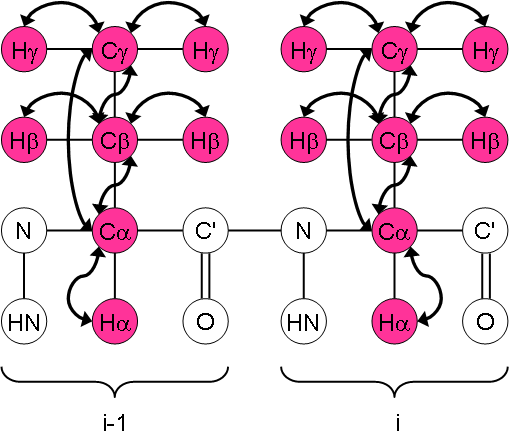 HCCH-TOCSY correlates protons within the spin system, where magnetization "propagates" along the chain using sufficiently strong RF field is applied to the C channel so that carbon magnetization is "locked" in the XY plane for a certain duration. The magnetization is locked because it has to precess around the effective field vector in the rotating frame of reference and the initial condition is set such that the orientation of the magnetization vector is close to parallel with the effective field. If you have one Carbon's magnetization locked like this, and it is coupled to a nearby carbon atom, then after a time 1/(2J) magnetization will transfer to the neighbor, then it can be transferred to the connected proton and observed. The carbon magnetization is created in the first place by transferring it from a connected proton. So you will observe H-H TOCSY correlations, where magnetization is transferred utilizing C-C scalar couplings - along the carbon chain (e.g. leucine side chain). In HC(C)H tocsy there will be two proton dimension and a third carbon dimension, where a proton on one of the H-dimensions will be bound to the carbon whose shift is at the C-dimension. You can imagine that magnetization can transfer along the aromatic side chain from Ha to HD and HE, but it is practically impossible because the strength of RF irradiation required would destroy the probe and possibly sample. The RF field for the spinlock must strong enough so that corresponding bandwidth is wider than the difference in the chemical shifts of affected carbon atoms. This problem becomes worse with high field instruments.